Liferay have good asset Frame work to manage Web content, Documents, Blogs, wikis and message board .It will help us segregate content and other assets. Liferay have introduced Vocabulary, Categories and Tags to segregate all the assets and its makes displaying assets very easy. We can make different set of assets and we can display these by group. These categories and tags will help us to refine search result so that end user always see relevant data when they search. Assume we have news portal and it has different kind of news and have different locations. The news may be National News, International News, Politics, Sports, Entertainments and Other types of news. We can say its parent category under this we can have child categories. Asset may associated with multiple vocabularies. It’s used to grouping assets, when we create any asset in Liferay we can map asset to specific category and we can also map one asset to multiple categories. Each vocabulary associated with one or more categories. News: Sports, Politics and Entertainment. In Liferay Asset is like some entity it may be Web content, Blog, wiki, Document and Message boards. All these we can consider as Asset. We can say each vocabulary can be associate with multiple categories and each asset can be associated with multiple categories and multiple tags. Assume we have News Portal it consist huge amount of web content. Now we can categorise the content as follows. In Liferay all assets mapping with group and group may be Site, Organization and User Group. These vocabulary Categories based on Group means each site have its own vocabulary and categories. Follow the article to know more about create Liferay Site. Then you site will be crated once created site then create some page for site. Go to pages section and click on site pages. Click on Add page then give page name as Home then save it now page will be created. Once you successfully created site then login as Site Administrator or Portal Administrator. Go to my sites then you can see newly created site (News Portal) click on your site then you will navigate to your site home page. Click on Add Vocabulary then it will launch you the screen to create new vocabulary now provide Name and Description. Finally click on save then new Vocabulary created for the site. 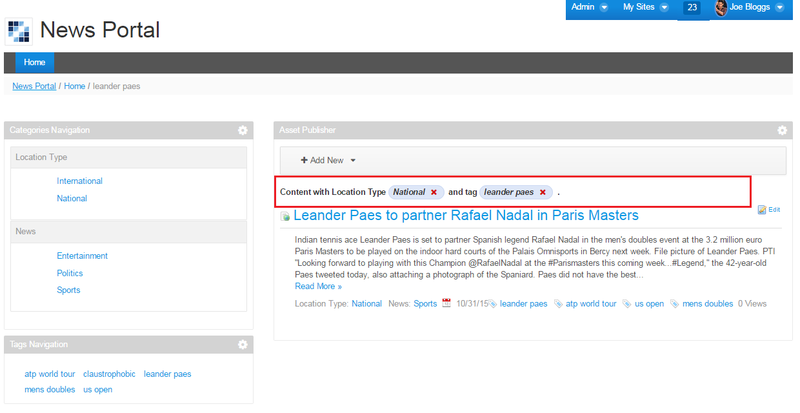 As for our example we are going to create News and Location Type. Same you use Add Vocabulary then create both. Click on Add Category then it will launch Add Category Popup window provide Name, Description and we need to map category with vocabulary. In the dropdown (To Vocabulary) you can select desired vocabulary. We successfully crated Vocabulary and Categories now we are going to news and mapping these categories. To prepare the news we will use Liferay web content Journal Articles. In the content section click on Web content and Add new Basic Web content. Provide Title and Design your content in the editor. In the right section you can see list of associated things for web content. Click on Categories section then you can associate category for your news. Click on each vocabulary Select button then you can see relevant categories from that select check box which related to your web content then close window. Now you can see categories associated to web content. You can also map multiple categories if the new belongs to National and International then you can selection both. Finally click on Publish then web content will be crated. The above process you can apply for each web content creation and select relevant categories and add relevant tags so that your news will be ready and you can display based on category and tags and users also can find relevant news when they search. Now we can display news based on categories. Liferay have provided portlet Asset Publisher from this we can display web content based on categories. Go to Page and Drag and Drop Asset Publisher portlet. It will be display if the given category or tag does not contains. Such a way we can display based on our need. Liferay also given category navigation portlet and this portlet we need use with asset publisher so that it will be display assets based on categories when we click on category. We need to always place this portlet with asset publisher portlet and we also have Tags Navigation portlet. When we click on Tags or Categories then Assets will be Filters in Asset Publisher. Thank you so much for this article. It was helpful.